Do you have a family or group of favorite friends who would love to come for a holiday to a beautiful valley on the border of Umbria and Tuscany, but no one has time to plan it? To stay in a lovely villa, to daily explore famous medieval hill towns, to seek out local artisans, and not have to drive? To dine on wonderful food and not have to lift a finger to cook or clean up? Let us do it for you. With all the arrangements made by us, you can just relax and enjoy your vacation. We offer week-long and daily personalized tours, for kids and grown-ups, for food, wine, art and garden lovers, for first-time and seasoned visitors to Italy alike. Write to Elizabeth at elizabethwholey@gmail.com and tell her what you would like to see and do during your stay. For a preview of your trip to Umbria, send for Elizabeth's new book, Sustenance: Food Traditions in Italy's Heartland, with a Guide to Farms, Markets, and Fairs in the Upper Tiber Valley. 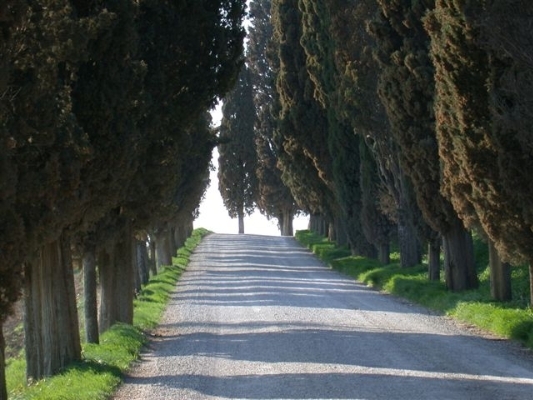 We meet at 1:30 pm at Terontola-Cortona train station, halfway between Florence and Rome, and are transported by comfortable minibus to our home for the next week, La Pietra, a recently-restored 17th century farmhouse with spectacular views over Umbria and Tuscany. At lunch we are introduced to selected foods from this region of farms and forests. After an optional country walk, we’ll taste some of the best local wines on the terrace at sunset. 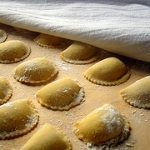 Dinner will be prepared by the Amore Sapore cooks, followed by roasted chestnuts and vinsanto around the blazing hearth. In the morning we’ll visit the nearby village of Preggio, where its famous harvest fair, the Chestnut Festival, will be in full swing. The local people transform the town’s wine cellars into tiny shops, selling locally-made delicacies and the new wine, or mosto. After a short, scenic drive into the next valley, we’ll arrive at picturesque Cortona for lunch at one of our favorite restaurants. Afterwards, you are free to explore Cortona’s back streets, museums and shops. The picture gallery contains one of the most beautiful paintings in central Italy, an Annunciation by Fra Angelico, as well as many works by Signorelli, who was born in Cortona. We return to our valley for dinner at a favorite ristorante, Nonna Gelsa. Since the thirteenth century the residents of Deruta have been making ceramics. The little Umbrian town is full of shops where you can see painters working at their craft, and we will introduce you to some of the masters. Following lunch in Deruta, we’ll head for Perugia, Umbria’s capital—a sophisticated university city, famous for its art museum, Etruscan and medieval architecture, chocolate and jazz festivals and fashionable shops. After an initial introduction to the city, you are free to wander on your own. We will join up later for some of Perugia’s best pizza. Wear your walking shoes! 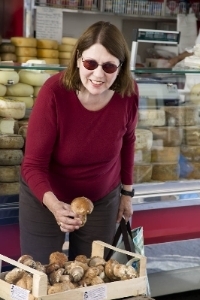 In the morning we visit the ancient hillside town of Gubbio and its weekly farmer’s market. Our guide will lead us on an architecture and history tour and we’ll learn about the area’s prehistoric importance, the Umbri tribal and Roman eras, and its height of power and influence in the early Renaissance. We lunch in a restored medieval cantina, returning home for a pasta demonstration and dinner with Amore Sapore. Today we’ll visit the lovely wine towns of southern Tuscany: Montepulciano, home of Vino Nobile, and Montalcino, of Brunello fame. We’ll also check out the ideal Renaissance town of Pienza, in recent times famous for its pecorino cheese, textiles and iron work. We’ll lunch at a country osteria near Sant’Antimo, an exquisite Romanesque church of French design, reputed to have been founded by Charlemagne. On the way home we’ll dine at Trattoria Mimmi in Mercatale, where Mimmi, in her seventies, still makes her own pasta and grills over the coals. Our first stop today is the bee keeper’s for acacia and chestnut honey and lovely candles, then we head north to Anghiari for a visit to an ancient olive mill and the famous Bussati textile workshop. After lunch at a typical Tuscan restaurant we hunt for truffles with Severio Bianconi, then head back to Severio’s farm for a discussion about how to cook with truffles, and an excellent meal created by Sra. Gabriella in which black and white truffles will be served in abundance. Off to the region’s most famous town, art-filled Assisi, where Italy’s beloved St. Francis founded his order. We are treated to a special visit to the home of a private collector of medieval art followed by a tour of the town and lunch—all’aperto, weather permitting. Then we return to La Pietra where Amore Sapore will serve up a fish dinner in honor of Umbria’s saint (a talking fish in Lake Trasimeno figured prominently in one of Francis’s miracles). We raise our glasses to the each other and to the food artisans of Italy! We depart La Pietra at 10 a.m. for Terontola station, carrying with us fond memories of our unforgettable week in Italy’s heartland.